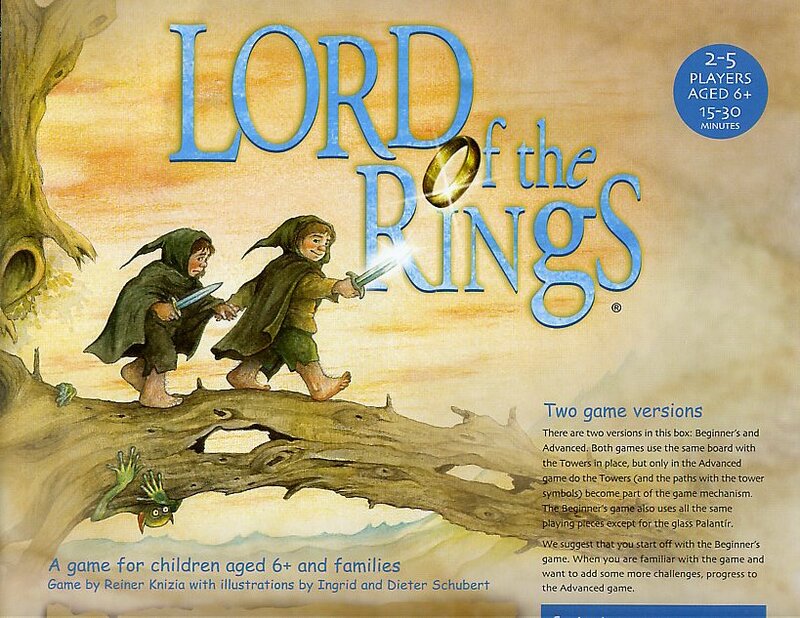 This is a children's boardgame that is based on the Lord of the Rings. It is fairly simple to play, hence the young age classification. There is no violence in the game, and is safe and fun for kids and their families to play together. It might stretch the patients of adults, but it is fun to play with kids. According to the rules, there are two versions in the box; Beginners and Advanced. Both games use the same board with the Towers in place, but only the advanced game do the Towers (and the paths with the tower symbols) become part of the game mechanism. The Beginners game also uses all the same playing pieces except for the glass Palantir. To prepare the game, the Towers are placed on the board in their appropriate places. The Sauron piece is placed on Mount Doom, and the Witch King and Shelob are placed close to Mount Doom. The rest of the Dark tiles are set face down. The Dark tiles are enemies, while the light tiles are friendly. The tiles are shuffled and then draw three friends and three enemies. These six tiles are placed on the board with the three friendly tiles closest to the Hobbit pieces on the board. The rest of the tiles are placed face down in two stacks, one Dark and one Light. Place the Red Cubes on the Enemy tiles as the number indicates (wolf has 2, Shelob has 6, etc). Each player chooses a Hobbit piece and are placed in Hobbiton and keeps a corresponding Hobbit card in front of the player. For the Advanced game, place the Palantir in the hole near Mount Doom. To start the game, the youngest player starts and continues clockwise. The dice has numbers 2 through 5 and one side has a Nazgul. 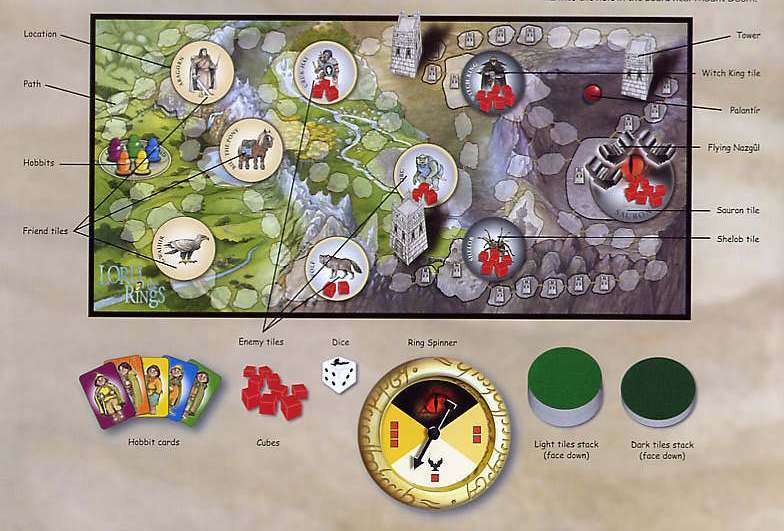 If a Nazgul is rolled, the player may move any of the Flying Naguls to another location to hold up an opponent. If you roll a number, move your Hobbit the respective number of spaces. You may also move fewer, or no spaces at all. Any number of Hobbits may occupy a space. No jumping is allowed. When a player lands on an Encounter Tile. The Ring Spinner is used to pass the Encounter Tile. The Nazgul Encounter Tile must be defeated before moving. 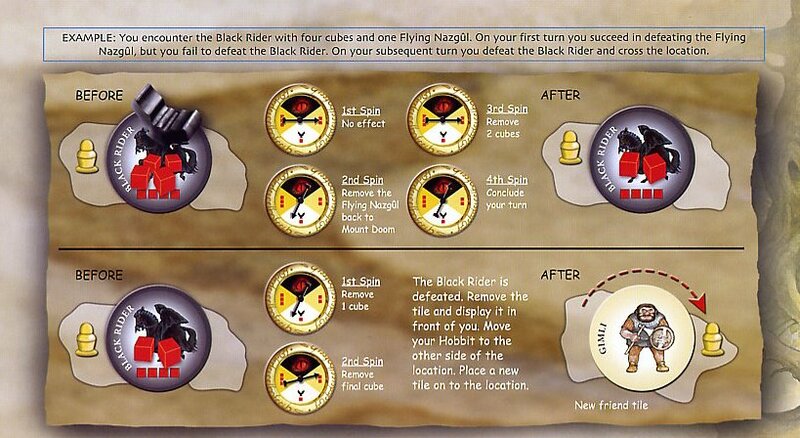 To defeat the Nazgul, the 1 cube/flying Nazgul must be spun. 2 and 3 cubes, then spin again. For the Dark Segment, you must conclude your turn and pass on to the next player. When you defeat the Nazgul, it returns to Mount Doom. If it is defeated on Mount Doom, then the Nazgul is removed from the game. For the other Enemy Tiles, when a 1, 2, or 3 cube is rolled, then remove that number of Red Cubes from the Enemy Tile until all the cubes for that Enemy are gone and defeated. If the Dark Segment is rolled, then the player must pass the play to the next player. When you encounter a Friend Tile, a 1, 2, or 3 cube is rolled, you succeed in winning the friend. If the Dark Segment is rolled, you guessed it, you loose your turn and pass on to the next player. When you successfully encounter a Friend or Enemy, remove the tile from the board, move to the other side of that space and place a new tile where you just passed for the next player to encounter. Note, the player keeps the Friend tile for the Advanced game. If all of the Dark or Light tiles are used during play, then the space remains empty and the other players just move across. The game ends when a Hobbit successfully encounters the large Sauron tile by removing its last cube, this player wins. For the advanced game, the rules stay the same with two added challenges. The Dark Towers are now used. When a player encounters a Tower (like the Enemy tiles), it is time to face the dangers of the Dark. One of the other players takes the Palantir and hides it one hand then holds out two closed hands out. The player must then guess which hand holds the Palantir. If the player guesses the hand with the Palantir, then that player is captured by the Dark Tower for one turn. The other added Advanced feature involves the Friend Tiles. After rolling the dice and moving your Hobbit, you may discard one friend tile to roll and move again. Or, after spinning the dark segment of the Ring, you may discard one friend tile to continue spinning. Or, after choosing the hand with the Palantir, the player may discard one friend tile to remain on your current space. 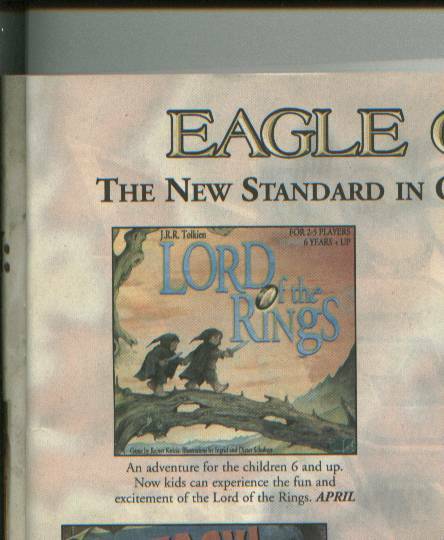 The Lords of the Rings childrens boardgame by Eagle Games is scheduled to come out in April 2003. Below is a picture of it from Game Trade Magazine March 2003.